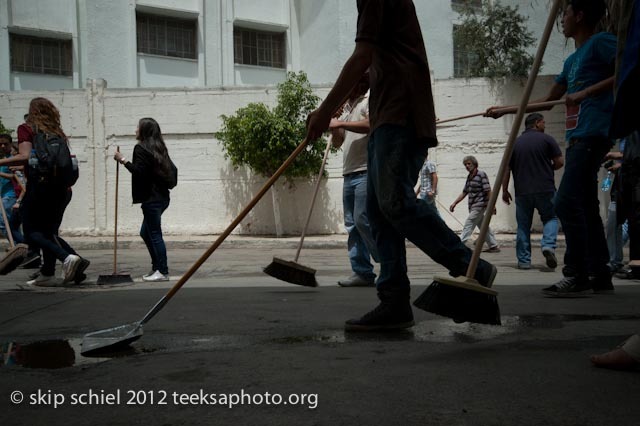 A much more orderly day yesterday for teaching: in the morning we headed for Tulkarem to photograph a demonstration about prisoners’ rights and a street sweeping event to illustrate need and motivation. 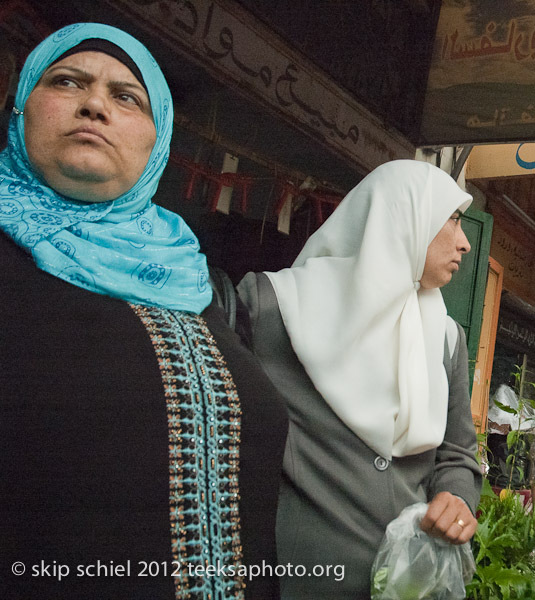 With the 4 girls in the workshop, Mustafa, and Ahmed, and about 25 energetic young men, we boarded 2 large buses in Jenin and drove 1 hour or so to this city near the Green Line and Apartheid Wall. The bus swayed and bumped along often narrow winding roads. Two of the girls vomited on the way, after calmly asking the driver for plastic bags (which reminded me that M always carries a bag on planes for that purpose), and finding a seat in the back of our nearly empty bus to deposit the remains of their morning meals. The first girl arrived at the theater, our designated meeting place, 30 minutes late. Others drifted in. Constant calls between Jonatan, the theater’s managing director, and me. Serveece (shared taxi) to the bus station, can’t find the bus, more calls, meanwhile I suggested they begin photographing at the station. D suggested the theme of workers. I began as a role model. We found the bus outside the Jenin Cinema (built in 2010, after my last journey here in 2009). And then on the bus I suggested they could photograph from the bus if they preset the camera. They all tried this. I might show them my Jordan Valley photo set which is partly from the car. 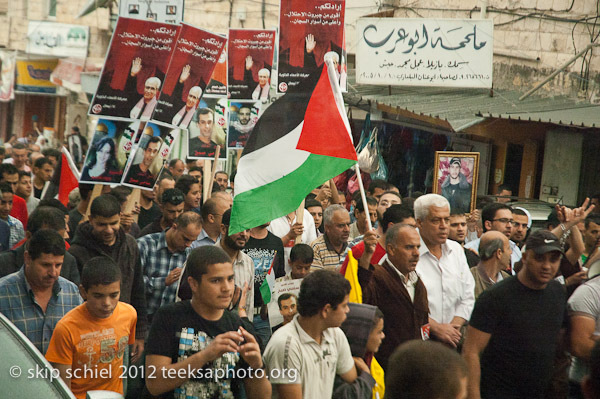 In Tulkarem we joined hundreds of other strongly motivated people from places like Tubas, Nablus, and even Nazareth. I might have easily been the oldest youth among them and some of the girls among the youngest. Another comedy, but this time not of errors. Early in the event as we marched to the speech site, I noticed the girls held back, did not join the throng, remained together, did little with their cameras. 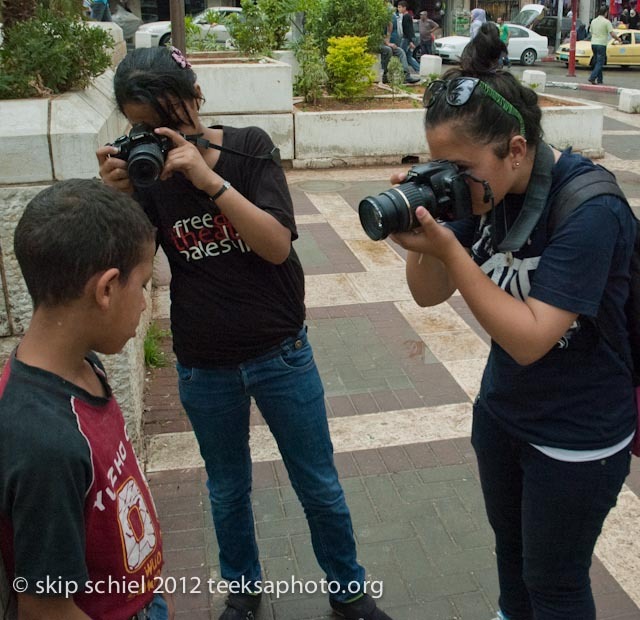 I exhorted them: size up the scene, move, get in there, get close, YALLA! With negligible results. 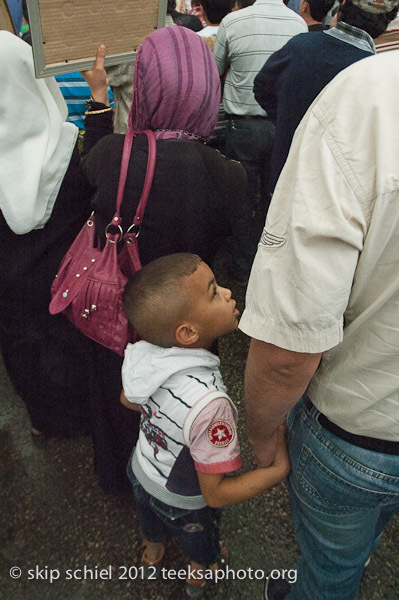 So I went to Mustafa and said, with my hands on his shoulders, Mustafa, I need your help! He looked alarmed. Perhaps he thought I was in danger or ill. The girls are doing very little photography. They need encouragement. Could you please speak to them? He railed at them to get going, YALLA! And they did. At the end of our fatiguing, nearly all-day journey, I praised them all, said (exaggerating) you all did so well, I look forward to working more with you. 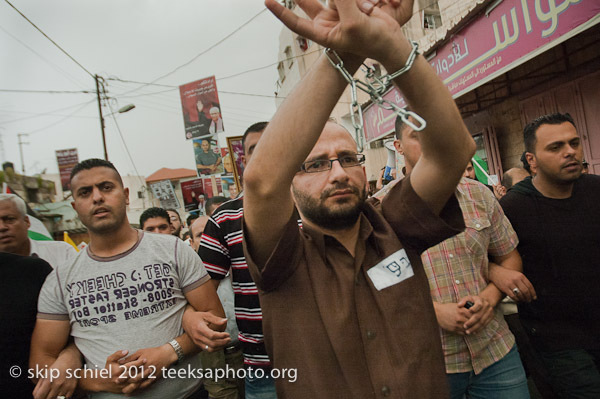 It was May Day in Palestine, an occasion to honor the incarcerated and demand better prison conditions. 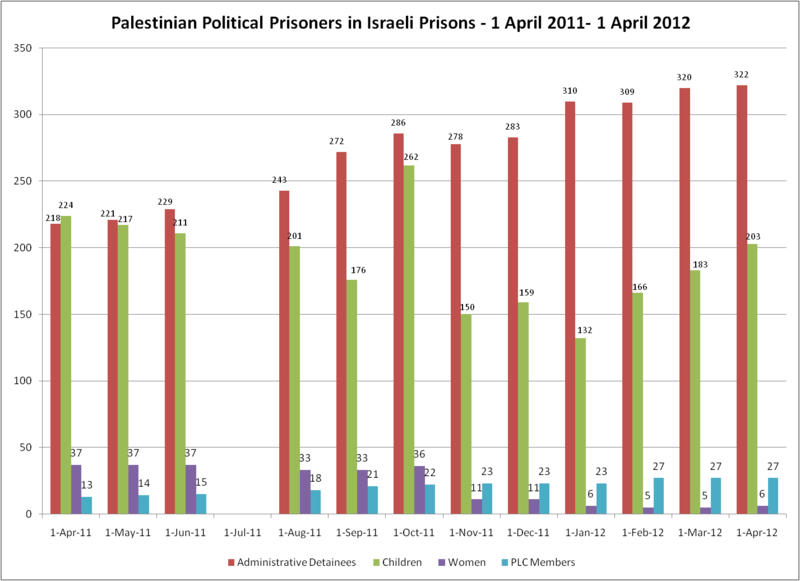 Prisoners’ rights is a main Palestinian theme, has been since and before my arrival 6 weeks ago. 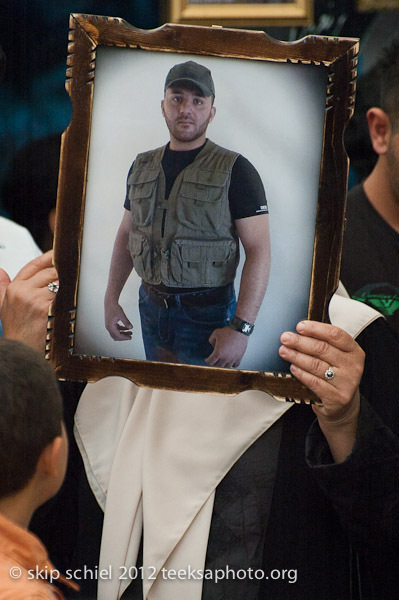 More than half the prisoners are on hunger strike. It’s been effective. 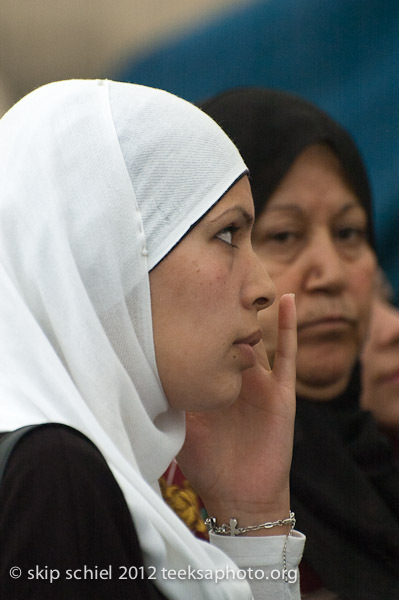 Israel released 2 recently who’d struck, a woman exiled to Gaza for 3 years and a man. Their cases were widely publicized. 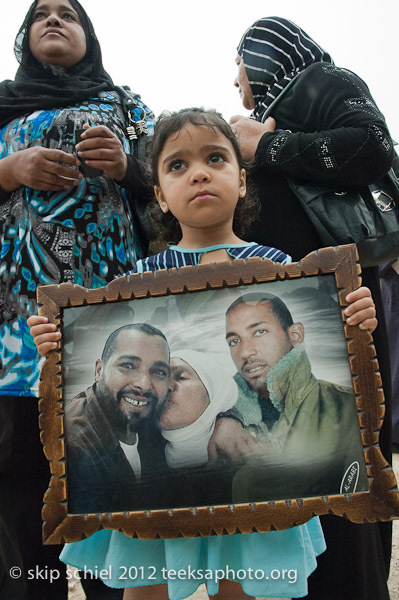 Some 5000 remain in prison, about 300 in administrative detention, which means no charges, no court appearance, held merely at the whim of the Israeli government, often indefinitely. Apartheid South Africa had a nearly identical policy. Add to that torture, isolation, no legal consultant, and the conditions become unbearable. As someone said, we have only our bodies for protest. The second strand yesterday was the youth-led city cleanup. This was highly photographable. Brooms and shovels and plastic trash bags. Plus zeal. 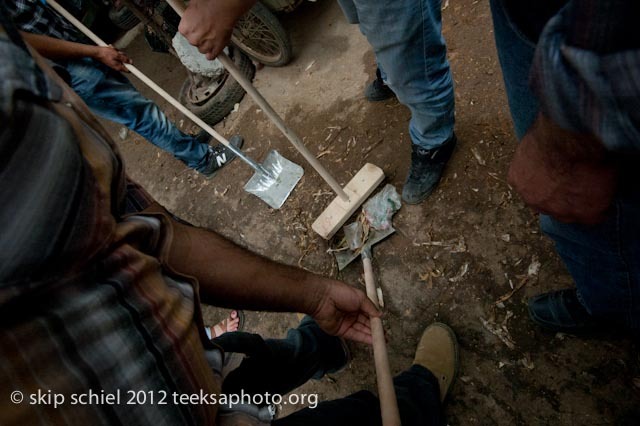 We paraded thru the city, including the souk (market), and swept up. What a dramatic event this was. 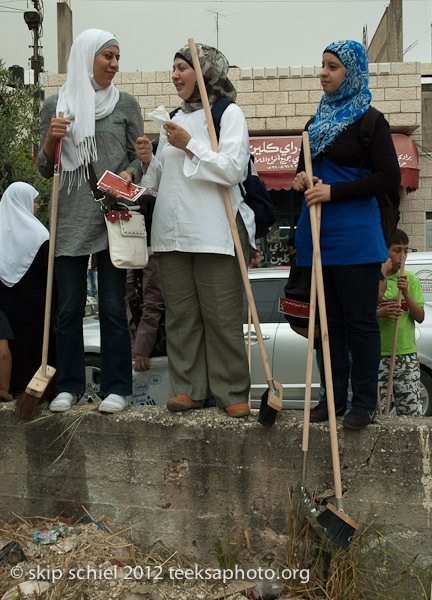 When we assembled for a group portrait and everyone held their “weapons of choice,” brooms and shovels, high in the air, I thought, this could have also been young women and men with AK-47 automatic rifles. 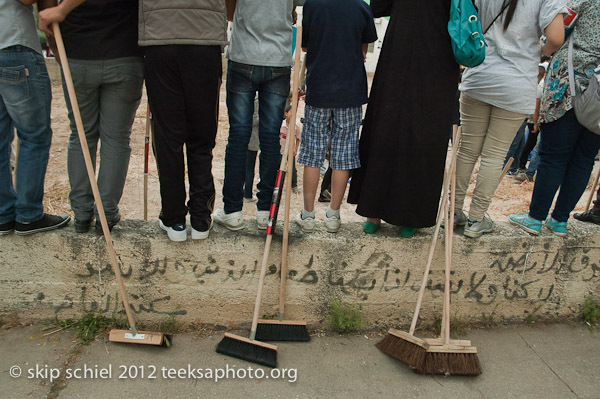 One might argue: where’s the resistance to occupation in cleaning up the city? Which is a good question. None, directly. Perhaps a distraction. Or perhaps a rallying point for later, more political work. Somewhat equivalent to the Popular Achievement Program run by the Quaker Palestine Youth Program of the American Friends Service Committee. Now what next steps for the photo workshop? Most likely the usual next steps for photography: download, select, organize, alter and enhance, organize again, and present. Begin that today. I phoned Jonatan while on the bus to Jenin and asked for computers. We will have 2 Macs to work with today [didn’t happen, will eventually], plus my laptop and a projector for demos. I’m not sure how interested they will be in this post production work. 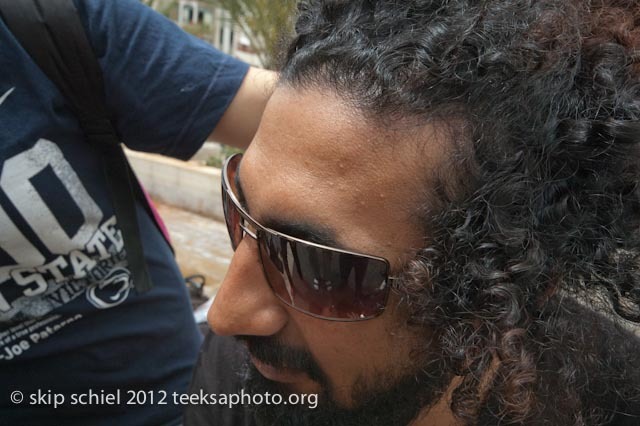 Previous teachers simply gathered the camera memory cards after students used the cameras and did all the follow-up. D, one of my lead students who plans to study photography in NYC, told me she wants to learn these steps. The high school group seems well launched. We are jelling. A structure is forming. D is 16 yrs old, enters high school next year, told me she has a scholarship to study photography in NYC, might have applied as an exchange student, and every summer visits her sister in Harrisburg Penn. Her sister visits here this summer. D has many photos in the kids’ magazine, might wish to become a photographer. She translates for me, and seems somewhat glum in demeanor. As if frustrated. Jonatan has been crucial to whatever success we salvage from this chaotic environment. He supervised getting everyone to the bus on time yesterday, and all the infrastructure, and constantly advises me on the intricacies of life at the theater and in the camp. No easy matter. 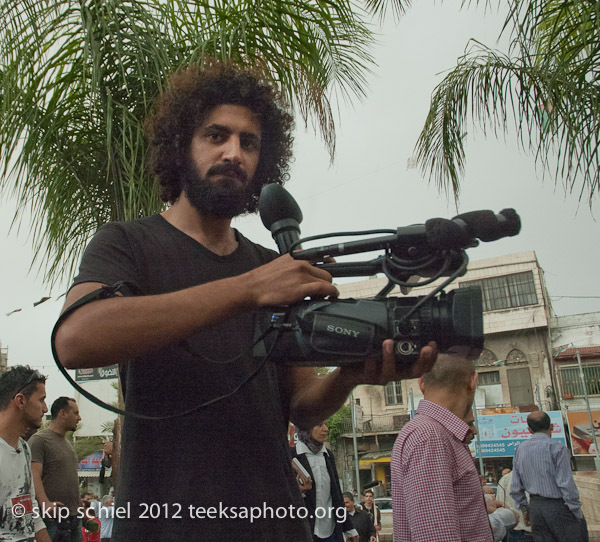 By comparison photographing for the Palestine News Network in Bethlehem and the American Friends Service Committee in Ramallah, my 2 previous assignments, was a breeze. I look forward to my next volunteer work with Friends of the Earth Middle East about the excavation of a cistern and preservation of terraces. And then maybe a relaxing jaunt thru the Negev desert alone in a rented car before I leave for home on May 28.